The Old Farmhouse dates back to the 1700’s and features a three bedroom suite with two baths and a private living room, wood burning fireplace and cable television. Each bedroom has a queen size bed and is decorated with antiques. A large porch wraps around the house where guests enjoy a rocking chair on a quiet evening. On the back of the farmhouse is a large deck that overlooks the creek and covered bridge. Hummingbirds and deer are often seen in the backyard of the house. Hickory Bridge Farm dates back into history as far as the late 1600s when the King of England granted the land to Charles Carroll the father of the signer of the Declaration of Independence. In 1764, the Mason Dixon Line placed the land of "Carroll's Delight" in Pennsylvania instead of Maryland. Mr. Carroll became disgusted with the people in the area because of religious disputes. He sold the land in 250 acre parcels called "Plantation" to Scotch Irish settlers. John Carrick was the settler who first established the farm where Hickory Bridge is located. His family built the farmhouse with mud and bricks made from the clay soil on the property. Several out buildings were also built for cooking, smoking of meats and a log barn for livestock. Mr. Carrick had two sons who became involved in the Revolutionary War. Son, Samuel, became a man of "Note". Samuel was a well known minister and teacher in southern Virginia and Tennessee. He founded a college that was called Blount College that later became the University of Tennessee. Mr. John Carrick lived until 1812 when he was almost 100 years old. His death was newsworthy since many people did not live that long. The next owners of the farm were the Herrings. They established a Distillery on the property near the spring. It is believed that this is the family who built the large barn where the restaurant is located (approx 1840s). The Herrings had the farm during the Civil War era. The only activity here during the war was that two soldiers stayed in a mill until the war ended. The mill was located just past the farm near the bridge. It is also believed that soldiers escaped the war by fleeing up the hollow and into the mountains. The Heintzelman family acquired the farm next and established a blacksmith shop on the property. They had a large family and a picture of this family is located in the restaurant. In 1905 they sold the farm to the Deardorff's. A copy of the public sale is also posted in the restaurant. We have dinner guests who come and tell about their childhood days here at the farm. Mr. and Mrs. Scott acquired the farm next. They owned a home in Gettysburg where Mrs. Scott served tourist meals. During the early sixties she saw a demand for serving larger groups and decided to change the barn into a farm-style restaurant. They catered the meals by bringing the prepared food to the farm from Gettysburg. Many guests remember coming to the farm and enjoying her meals as well as the many animals around the farm. She also had pony and hay rides for the guests. Later the farm was inherited by Emma Fink and was then sold to our family in 1977. Dr. & Mrs. Hammett became involved in the hospitality industry through a research project in Fairfield which resulted in the purchase of the Fairfield Inn (formerly known as the Fairfield Hotel). Our family restored the inn as a "family project". Beneath the paneling and plaster we found old woodwork, fireplaces and its rich history. In 1977, my parents had the opportunity to sell the Inn and purchase Hickory Bridge Farm for a little slower pace of life. After a major clean-up process, we had plans of serving just large parties however, it has grown into serving to the public on the weekends along with the midweek banquets, Bed and Breakfast, gift shop, and a full-time farm operation. Our farm-style dinners have become very popular and are served in the old Penna. barn furnished with many farm related antiques. Each table is decorated with old fashioned dinnerware and cloth linens. All farm dinners consist of typical American Foods which were favored by the German settlers of this area and are our family recipes. Many fruits and vegetables used are from our own garden or neighboring farms. Most of our guests know they don't get a printed menu when they come to the Farm. Our menu changes each weekend (a list of entrees is in our newsletter). Dinner begins with a warm or cold apple juice and appetizers served from an antique sleigh. When guests are seated, we provide a lovely salad with our own warm bacon dressing that is complimented with homemade spiced peaches, fresh potato bread and apple butter. Dinner always has three entrees (one is Crab Imperial), several vegetables, stewed apples, and corn fritters-all passed "farm style" at your own table. Like all farm dinners, a meal would not be complete without dessert. 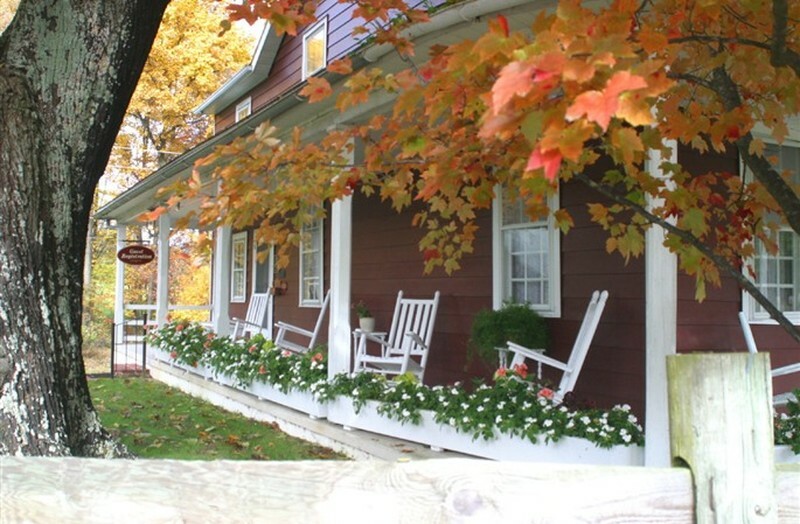 Bed and Breakfast accommodations located in cottages which were built by the Scott's. These cottages are located in the woods along a mountain stream. Each room has its own private bath, fireplace and air conditioning. A full farm breakfast is offered each day except on Sunday when we take breakfast to our guest's cottage. Farmhouse accommodations with whirlpools are available as well. In 1998 the "reins" were passed on to the next generation. It has been a pleasure to raise our family at the farm with the influence of many wonderful guests. We also have the privilege to farm approximately 600 acres. We raise beef cattle and sell mostly hay. We appreciate you being part of our Hickory Bridge family and hope that we will see you again.